Featured » Wetlands Working for You! With over a meter of rain fall in Vancouver each year, storm water management is a key priority for city planners and environmental scientists alike. Storm runoff often contains high levels of heavy metals and other environmental pollutants that can put vulnerable ecosystems at risk. One way to help manage storm water pollution is through the creation of manmade or engineered wetlands like the one found in the northwest corner of Lost Lagoon. Many species of aquatic plants have the ability to capture heavy metals from the water table, storing them where they may be broken down further by a host of different microorganisms. Not only do these wetlands help filter out heavy metals, they also have the added benefit of providing important habitat for birds and other wildlife. 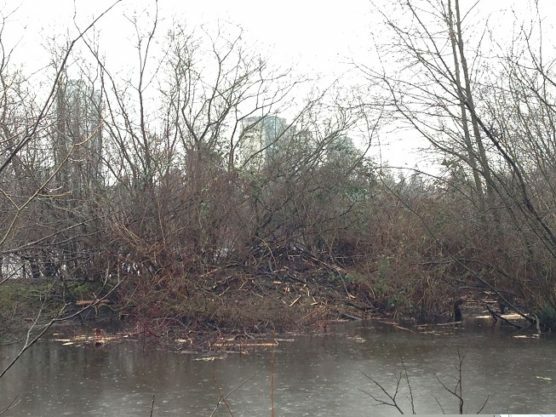 In fact, Lost Lagoon’s resident beavers liked the engineered wetland so much, they decided to build their second lodge there. SPES has partnered with Kerr Wood Leidel (KWL) consultants and the UBC Department of Civil Engineering at Lost Lagoon to further study the effectiveness of engineered wetlands. With over 50,000 cars passing by Lost Lagoon each day, this is a prime location to test for heavy metal runoff. UBC Civil Engineering student Jessica Le Noble has been studying the effectiveness of the wetland in Lost Lagoon as part of her master thesis. To better verify that the engineered wetlands are meeting water treatment objectives, Jessica hopes to develop a DNA-based monitoring tool to analyze the composition and function of the microbes of these polluted wetlands. It is hypothesized that wetland microbial communities change in composition and function as stormwater and its pollutants saturate their environment. Her testing is now complete and SPES will keep you updated once all the results are in. Next time you’re taking a leisurely walk around Lost Lagoon, be sure stop and check out this hard working wetland, and watch for a beaver or two engineering their own changes to the site.